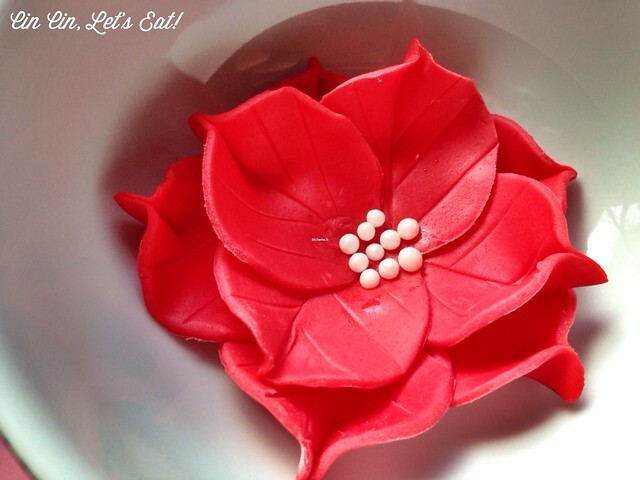 Fondant Poinsettias Tutorial – Cin Cin, Let's Eat! I have quite a bit of red fondant leftover from making the Very Hungry Caterpillar cupcakes for the book-themed baby shower, so I decided to make some fondant poinsettias to decorate all the holiday treats and cakes. I know gum paste is better for this purpose since it dries faster, but fondant was all I had. 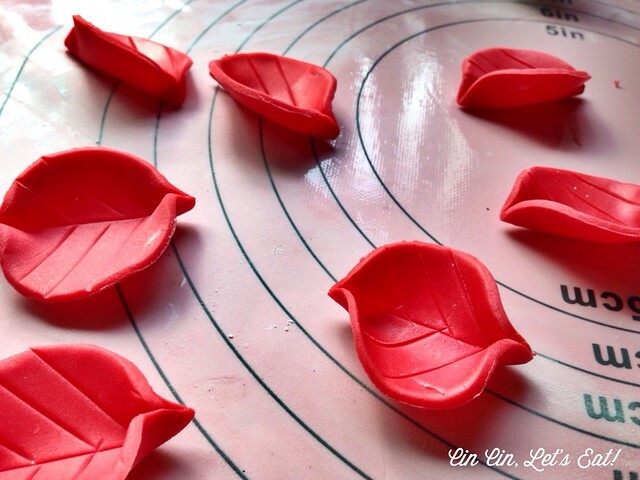 There are lots of tutorials online for different shapes and sizes of poinsettias but I found this one from Cake Design Italia to be especially beautiful and very simple, perfect for fondant novice like me. 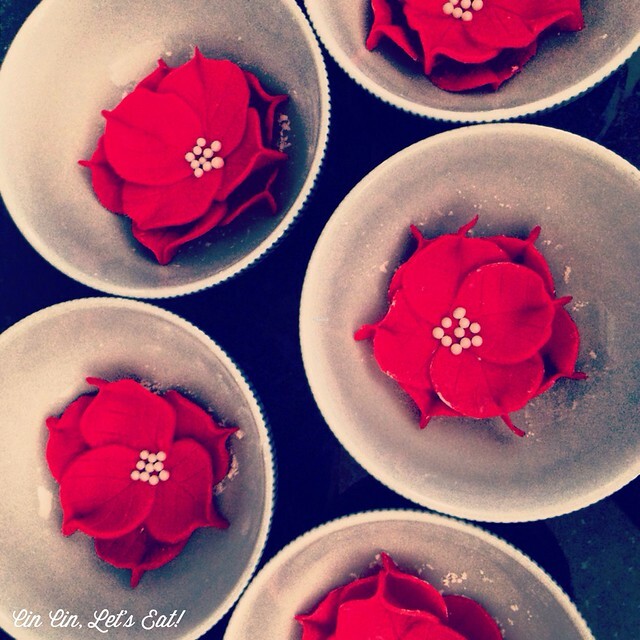 With some simple modification, I now have tons of beautiful fondant poinsettias to decorate cupcakes and yule log cakes. For starters, I did not mix or make the fondant. I purchased a small tub (plain buttercream flavor) from Fondarific. 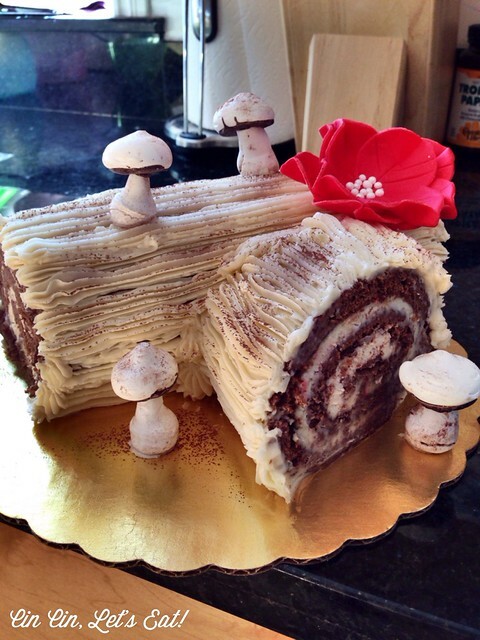 It was very easy to work with and tastes pretty great for fondant! An 8 oz container will yield you at least 10-12 flowers. If the fondant is too hard, microwave for a short 10-second. Knead and work with your hands until soft and pliable. If the fondant is cracking at the edges, keep kneading it until softer. 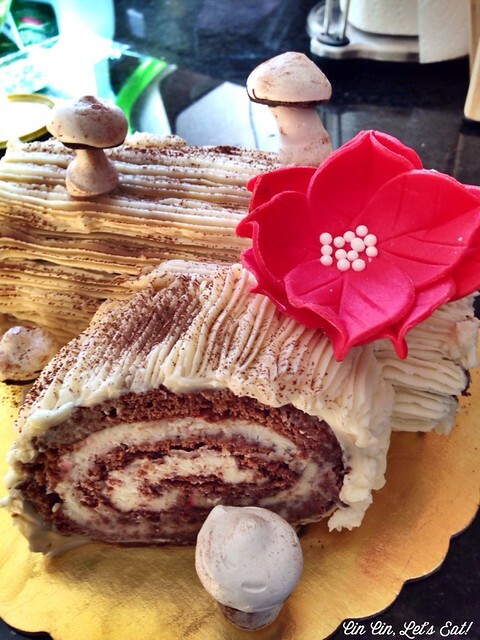 On a surface dusted with powdered sugar, roll out the fondant to ~1/10″ thickness. 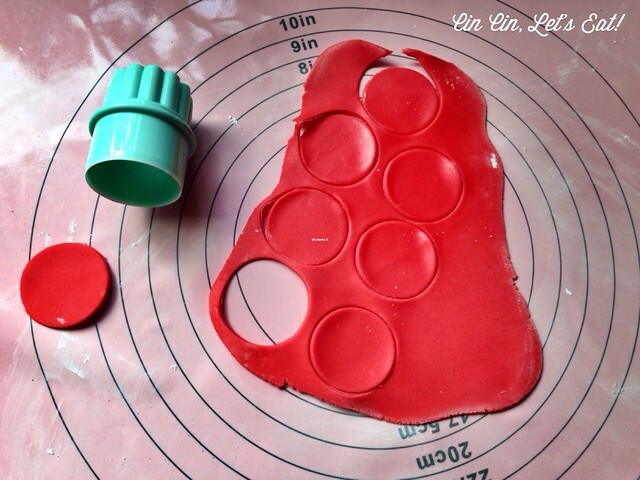 Use an 1″ circle cookie cutter and cut out 9 circles. 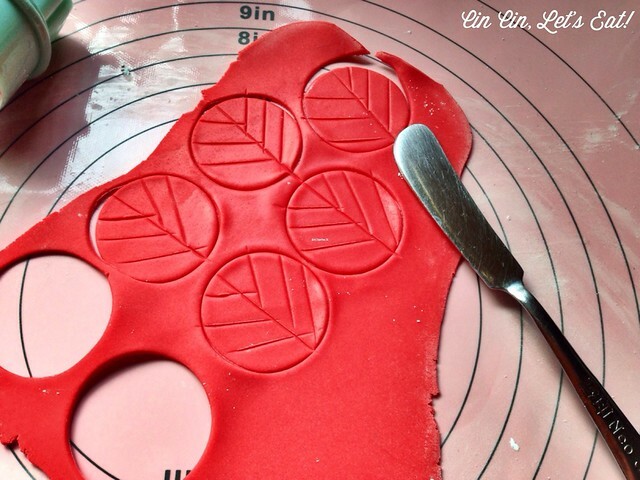 Using a butter knife (because I don’t own any fondant tools) and mark / imprint leave pattern on each circle. My poinsettias have two layers: bottom layer has five petals, and top layer has four. Press the tip of each petals together. If needed, a slightly damp finger (but not dripping wet) will help gluing the petals together. Press some sugar pearls near the center of the poinsettia, and place the finished flower in the prepared bowl. 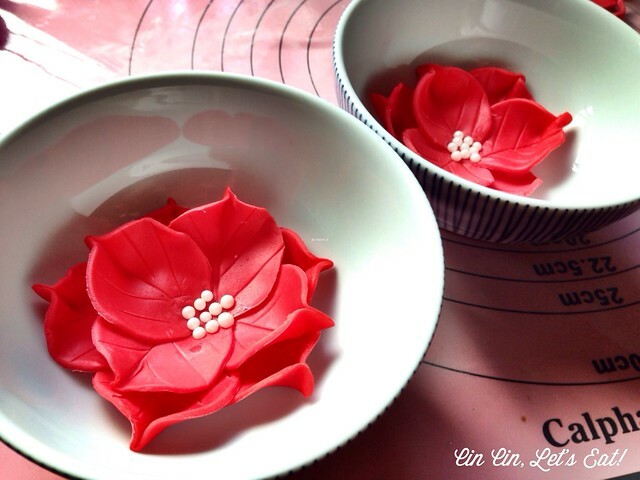 Fondant takes a lot longer to dry because of its moisture content. Mine took about 3-4 days to dry and harden. Keep the dried flowers in an airtight container and they will keep for a very long time. This is way too pretty for me to tackle, but I love how yours turned out. Great tutorial. Gorgeous! Both the creations and creator. 🙂 C’est magnifique! Op wordpress kwam ik een mooie how to tegen van deze bloem. Zeker niet moeilijk en ook goed te gebruiken voor iemand die weinig ‘taart’materialen heeft.